1. During their time Maximianus and Maximinus sent throughout all the territory of their empire an edict against all the followers of the true religion of Christ, that they could escape tortures and live by tasting food which had been offered in sacrifice, and that those who spoke against this were to be surrendered to the judges and subjected to many different punishments. At this time Theodore was conscripted for military service, and together with him many other recruits, and was assigned to a legion titled the legio Marmaritarum under the command of the praepositus Brincas. This legion was staying in the city of Amasea in the province of Hellespontus, where all were being compelled to offer sacrifice to the idols in accordance with the imperial edict. 2. When he spoke out against these things blessed Theodore was brought to the praepositus Brincas. Brincas said to him, "Why do you not obey the commands of the emperors' and offer sacrifice to the immortal gods ?" Blessed Theodore, since he was faithful to God and filled with the Holy Spirit, replied, stand- ing in the midst of the legion, "It is because I am a Christian that I have not accepted the command to offer sacrifice to evil images; for I have as my king Christ in heaven." The praepositus Brincas said to him, "Take your arms, Theodore, and accept military service; agree to sacrifice to the immortal gods, and obey the victorious emperors." But saint Theodore said in reply, "I serve my emperor and cannot serve another." The praepositus Brincas said, "All these standing about are Christians, and they serve." Theodore said, "Each knows how he serves. But I serve my lord and king of heaven, God, and his only son Jesus Christ." The ducenarius Possidonius said, "So, your God has a son ?" Saint Theodore replied, "He has a son who is the Truth through whom all things were made." The praepositus said to him, "Can we know him ?" Saint Theodore replied, "I wish that he would give such understanding to you as to recognise him." Possidonius the ducinarius asked, "And if we recognise him, will we be able to leave the earthly emperor and go to him ?" Saint Theodore replied, "There is nothing which prevents you from deserting the darkness, and the trust which you hold in the house of your temporal and mortal earthly king, and going over to the Lord, the living and eternal heavenly king, in order to become soldiers like me." The praepositus Brincas said, "Let us give him a truce for a few days in order to take stock with himself and be converted to what is best." 3. When he had received this time to think blessed Theodore remained in prayer. The officials, troubled also about the other Christians, went about the city to capture whoever else they found believing in Christ. When they had seized some they brought them to jail. Blessed Theodore, sitting with them, taught them the way of salvation and perseverance, saying, "Do not fear these tortures which are being inflicted upon you in order for you to deny the heavenly king and lord, Jesus Christ." When he had said these and similar things to those who had been locked-up, he waited for an opportune time and entered by night the temple of the mother of the gods. He set fire to it, and burned it. But he was seen by someone, and accused. The book-keeper Cronides was terrified when he learned what had been done. He seized blessed Theodore and brought him to the governor Publius, saying, "This pest, a recent con- script, came into our city, set fire to the ancient temple of the mother of the gods, and harmed our gods. Thus I seized him, and have brought him to your highness in order for him to pay the penalty, in accordance with the command of our victorious emperors, for his bold deeds against our gods." The judge, when he had listened to the praepositus Brincas who had been summoned, said to him, "Did you give him amnesty in order to set fire to the temple of our gods ?" In response he said, "I exhorted him often, and gave him an amnesty in order for him to think matters over with himself, and to compromise with us and make sacrificial offerings to the gods. If he has done this, since you are the judge, charge him in accordance with your authority as one who has con- tempt for the gods and despises the commands of our victorious emperors." Thus, seated on his platform, the governor ordered blessed Theodore to be brought to him." 4. When he had been brought the governor said to him, "Why have you set fire to and burned our goddess instead of sacrificing to her with incense and libations ?" Blessed Theodore said, "I do not deny what I have done. I have burned her with fire. Such is your goddess, and her power, that fire can touch and burn her. I have burned wood in order to set fire to stone." Then, filled with fury, the governor ordered that he be beaten, saying, "Do not answer me with speeches. The most bitter tortures await you in order to make you obey the commands of the emperors." Blessed Theodore said, "I do not surrender to you, nor do I fear your punishments, even if they are extremely fearful. So do what you want. For the expectation of good things calls me to be confident on account of the hope which has been placed in me and the crown which My Lord Jesus Christ has prepared for me." The judge said, "Sacrifice to the gods and save yourself from the tortures which have been prepared for you." Saint Theodore said, "Those tortures which you are bringing are not fearful to me. My Lord and king, Jesus Christ, stands before my face, he who will rescue me from your punishments, whom you do not see because you do not see with the eyes of your heart." Thus the judge was angered, and roaring like a lion he ordered him to be thrown into prison, that the door of the prison be sealed, and that he be left there to die of hunger. 5. But blessed Theodore was nourished by the Holy Spirit. Moreover that same night there appeared to him the Lord, saying, "Take courage, my servant Theodore, because I am with you. So do not accept either food or drink from those men. For there is everlasting food for you in heaven." And when he had said these things he left him. And when the Lord had ascended away from him blessed Theodore began to rejoice and sing psalms to the Lord. Moreover there were many people listening to him. When the prison-guards heard these things and saw that the door was closed and the seal intact, they looked through the window and saw a great crowd dressed in white singing together with saint Theodore. They went away in fear and reported these things to the judge. And when he heard these things the judge rose and ran with haste. He reached the door of the prison, saw the prison was indeed locked, and heard the voices of those singing with blessed Theodore. When he had heard these the governor ordered that armed soldiers stand on guard in a circuit outside the prison, thinking that some Christians were inside with blessed Theodore. He opened it up, went inside and found no-one except only the holy servant of God Theodore pushed-down on the wooden [floor]. And great fear seized him and those who were with him. They went out bewildered and locking the prison again departed. Then the governor ordered that a loaf of bread and a cup of water be given daily to blessed Theodore. But Christ's faithful martyr, in accordance with scripture that the just man lives on faith, did so and did not accept any food from them, but only said to himself, "Christ, My Lord and King, nourishes me." 6. When it was morning the governor ordered blessed Theodore to be brought to him, and said to him, "Acquiesce, Theodore, save yourself from the tortures and offer sacrifice to the gods, so that I may quickly write to the emperors, lords of the world, that Theodore has become a priest, receives great honors from us and will be our companion." Blessed Theodore, looking up at Heaven and crossing himself, said to the governor, "Even if you burn my flesh with fire, inflict various punishments and surrender me to the sword until I breathe-out my last, I will not deny My Lord." Thus the governor, when he had heard these things and taken counsel with the praepositus, ordered the torturers to hang him up on a wooden frame and scrape his sides with iron claws. These scraped him to such an extent that his ribs were laid bare. However blessed Theodore made no answer to the governor, but recited the psalms, saying, "I will bless the Lord for all time, his praise will be upon my lips always." The governor, amazed at such great endurance by the blessed martyr, said to him, "Are you not ashamed, you most wretched of all men, to hope in a man who is called Christ, and who died so badly ? Are you surrendering yourself in this way, without reason, to such punishments and tortures ?" But the holy martyr said, "This madness of mine is that of all who call upon the name of My Lord Jesus Christ." The crowds were shouting to take him down because he had already been killed, and then the governor interrogated him through a herald, saying, "Are you willing to offer sacrifice or do you want to be tortured still further by me ?" 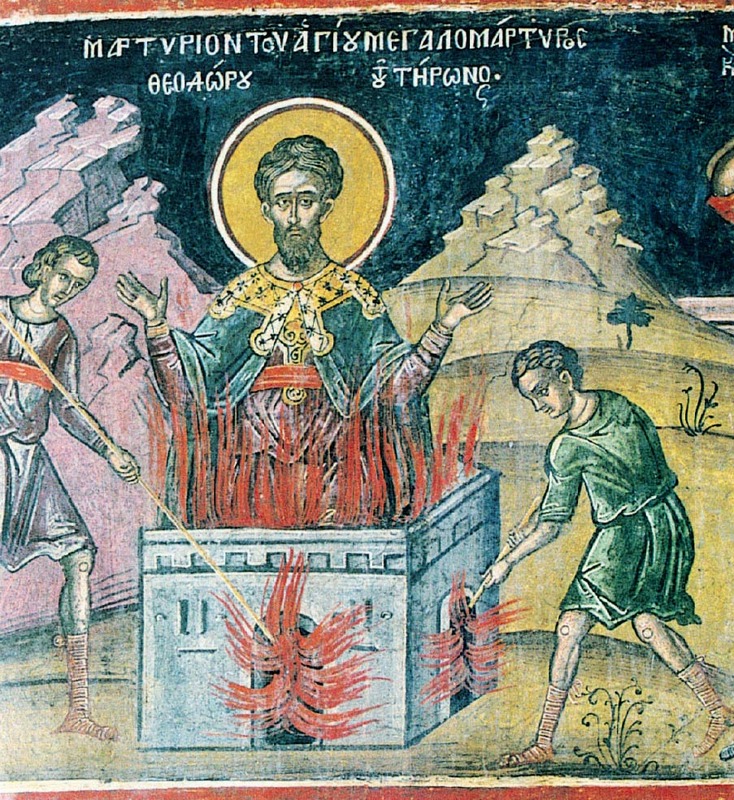 In reply blessed Theodore said confidently to the governor, "O you most wicked man, filled with every evil, you son of the devil, truly worthy of Satan's work, do you not fear the Lord who gave you this power, through whom kings rule and tyrants obtain land, but compel me to desert the living God and worship lifeless stones ?" Then the judge, with much shuffling of [papers], said to the holy martyr, "What do you want ? to be with us or with your Christ ?" To which the holy martyr replied with great joy, "I have been, am, and shall be with my Christ." 7. Seeing that he could not overcome the endurance of the holy martyr through tortures [the governor] passed sentence against him, speaking thus, "I order that Theodore, who does not obey the command of the victorious emperors and the power of the gods, who believes in Jesus Christ who was crucified under Pontius Pilate, as I hear from the Jews, be surrendered to fire." Immediately as he passed sentence the instruction was performed simultaneously with his command. The torturers, who had been continuously gathering wood from the traders and the baths, led him to the place which had been prepared. When fire had been kindled, laying aside his clothes and unloosing his belt, he wished also to undo his shoes, and each of the faithful was hurrying to be the first to touch his perspiration. They were all coming and touching him before his passion. They brought to him immediately those necessities which had been gathered for the fire. 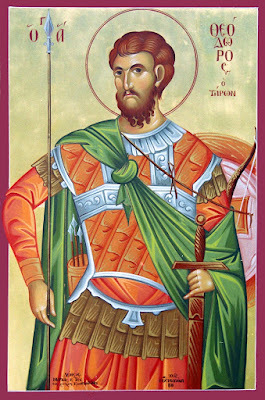 To those who wished to pierce him the blessed martyr said, "Support me; he who has given me endurance in my punishments will him- self grant also that I endure untouched the force of the fire." They did not pierce him then, but only tied him up and went away. But the holy martyr, speaking the words of the sign of the cross, with his hands tied behind his back, like a ram chosen from a great flock readied and accepted as a holocaust to God, looked up to heaven and said, "Lord God Almighty, Father of your blessed Son Jesus Christ through whom we received knowledge of you, God of virtues and of every creature and every nation of just men who live in your presence, I bless you because you have made me worthy of this day and hour that I may receive a part with the holy martyrs before Christ the Savior at the resurrection, and eternal life of body and soul through the preserving gift of the Holy Spirit. I will be taken up among the martyrs into your sight today as a rich and acceptable sacrifice which you have beforehand tested, tried and discovered to be without fault. For you are the true God, and I praise you accordingly, asking and beseeching you through Our Lord Jesus Christ, your beloved Son. Grant also, Lord, that those who have been detained with me will reach this palm." 8. And watching with his eyes he saw Cleonicus, who had been conscripted with him, standing and weeping in the crowd, and crying-out he said, "Cleonicus, I await you. Hurry and join me. For we did not desert each other in this earthly life and let us not be separated from each other in the heavenly life." And when he had finished talking he prayed, saying, "Lord Jesus Christ, Mediator between God and men, you who have shown me worthy to win this contest, I thank and praise and glorify the name of the Father and the Son and the Holy Spirit throughout the ages. Amen." And when he had finished praying the servants of the devil lit the great fire. But while a great flame flickered we to whom it was granted to see saw a miracle, and we were preserved in order to report to others the things which occurred. For the flame took the shape of an arched roof, like a ship's sail filled by the wind, and surrounded the body of the holy martyr. And it was not so much like a corpse burning but like bread being baked. The Holy Spirit arrived, and the holy martyr, without harm in the midst of the flame, praised and glorified God, and returned his spirit to Christ. He was taken into the heavens on 9 November. We were all filled with the most pleasant fragrance. Moreover a voice came down to him from the heavens, saying "Come, my beloved, Theodore, enter into the joy of your Lord because you have faithfully completed the course of your struggle." We who were standing about saw and heard all these things, and we also saw the heavens opened above him. 9. A certain woman of noble birth by the name of Eusebia came and sought the body of the holy martyr Theodore. Embalming his holy body with wine and precious ointments she wrapped it in clean cloth, placed it in a casket, and took it to her estate which was one day's journey distant from the city of Amasea, into an area called Euchaita. She decided to turn her estate into a church. She made her house there perfect and holy. And she celebrated everyday there the commemoration of the blessed martyr Theodore. In that place many were cleansed of evil spirits and various infirmities through him, even to the present day, to the praise and glory of God the Father and the Son and the Holy Spirit who lives and reigns now and forever and until the end of time. Amen.